The Muskrat is a semi-aquatic rodent native to North America and introduced into northern Europe and all the way through to Russia. They are very successful and adaptable, rather like some actual rats, but they are more closely related to voles and lemmings. A glimpse at their skull reveals... teeth mostly. Being rodents, they have upper and lower incisors that grow continuously and have to be kept in control by gnawing. It also keeps them sharp. They have no canines at all, there's just that great, big space before the premolars. Most rodents eat only seeds and plants, muskrats on the other hand, can also use those incisors on frogs, fish, turtles, crayfish and mussels. Also self defence. I don't actually know how bitey rodents can be, but look at those teeth! It can't be good, can it? 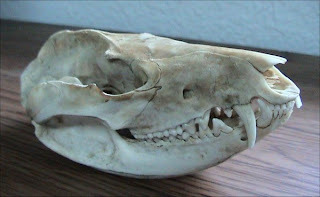 One look at that skull and you immediately know that this is not a rodent, but it is a bit like a really big rat. Virginia Opossums are actually marsupials, so they can't get much more distantly related to rats whilst still being a mammal. They can be found, or avoided, in North and Central America. A really big one can have a body length of almost a metre, with a despicably hairless, prehensile tail that can reach almost 50 cm long. They also have 50 teeth and, as you can see, they very much DO have canines. Long, ferocious canines. These can be bared in anger, accompanied with hissing and screeching and general scariness when it feels threatened. Sometimes it can all get too much for the Virginia Opossum and he will sort of, faint. This is "playing possum", where it lies on the ground, acts dead and emits a horrible, putrid stench. It actually seems to be an involuntary defence mechanism triggered by extreme fear, rather than a rational response undertaken after responsible cost-benefit analysis. I'll forgive them for that. Especially with those teeth. Like the muskrat they are successful partly through their omnivorous diet. These opossums will even sift through human rubbish for morsels of food. I've never really understood owls. It always looked to me like they have almost no beak at all, and surely not enough to rip and tear at the rodents and such that make up their meaty diet. It's quite enlightening then to see their skull, with its large, hooked beak. I guess their skull is at some sort of downward angle or something? Actually, I've just seen this picture. It seems that owls just have an astonishing amount of plumage. Wow! It's like they're mostly feathers! Anyway, you can also see those huge eyes for excellent nocturnal vision, even though Barn Owl hearing is so utterly amazing they don't even need vision in order to successfully hunt. 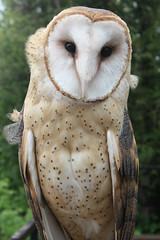 Barn Owls can be found... where can they NOT be found? They aren't in Canada, Greenland, Scandinavia, the centre of the Saharan desert, Russia, most of Asia, New Zealand or some Southeast Asian islands. So they avoid a lot of cold and some of the deserts, but they are extremely well travelled. The Blue Whale is the biggest animal in the world ever. It's utterly gigantic at some 33 metres (108 ft) in length and 200 tons in weight. Mind. Boggled. 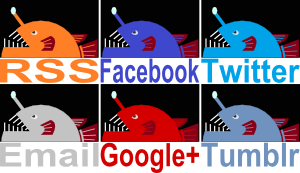 They eat almost only Krill, which range in size from small to tiny. You might notice that the Blue Whale has absolutely no teeth whatsoever. They would actually be completely useless for eating thousands of such minuscule creatures. Pff, did I say "thousands"? I meant some 40 million Krill per day. Mind. Boggled. Instead, their upper jaw is armed with what looks like a massive comb with hairy ends. 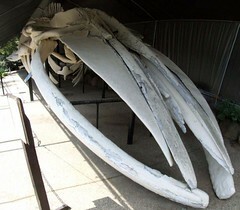 It's called baleen and is made of keratin, like fingernails, claws and hair. The Blue Whale takes a gigantic mouthful of water and presses its gigantic tongue against the roof of its gigantic mouth. Water is squeezed out but the Krill is filtered, trapped and eaten. All this is done with those hugely dense swarms of Krill, but the Blue Whale can't help but eat the odd bird, fish or squid. I wonder if they even notice? Gosh. This doesn't look too good, does it? Sharks have a skeleton made of cartilage rather than bone, so its a bit more flexible and kind of soft. The jaws however, are more calcified to toughen them up but they are still more flexible than bone. Also, the jaws aren't connected to the skull. All this means that sharks can open their mouths very widely indeed and absorb the shock of lunging at prey with appalling speed. It also means that one commonly sees the tough shark jaws but seldom any other part of the skeleton. A closer look and we can see an impressively disgusting array of teeth. Those gnashers are constantly growing, falling out and getting replaced by the next one in the queue. Dentists aren't needed at all, which is good if you insist on using your open mouth as a battering ram. Grey Nurse Sharks are noted for their particularly horrific teeth which are used on fish, squid, crustaceans and other sharks. They reach 3.5 m (11.5 ft) in length and live in coastal waters around the world. Lucky world. 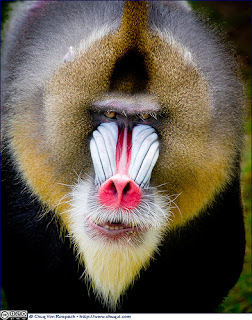 The Mandrill is the biggest monkey in the world and one look at those teeth should tell you that despite the colourful face, this is no clown. Look at those canines! They are gigantic! Mandrills live in social groups comprising a bunch of females and young males with one dominant male. I really don't want to imagine a fight between these guys. Males can get to about a metre long, females about 70 cm. They live in a small area of west Africa and are omnivorous, eating plants, insects and small animals. They have also been seen hunting a small antelope. I don't much want to imagine that either. The American Alligator is from the wetlands of south-eastern United States where they are well camouflaged against the dark waters they cruise around in. Their skull leaves very little to the imagination. You can see that they have no way of chewing their food, which quite obviously comprises other animals. Pretty much any other animal. A big, male American Alligator can reach 4.4 m (14.5 ft) in length, at which point anything with flesh is fair game. Fish and such can be eaten whole, whereas something larger like a deer has to have chunks bitten out of it. It's interesting how there doesn't seem to be much flesh on this particular bone, you can really see exactly what the living alligator looks like. Goodness me. Golly gosh. Holey moley. What the... I was utterly astounded when I saw the skull of the Hippopotamus. It is utterly absurd and astoundingly Monstrous. This is a barbaric skull. Had I never seen a Hippopotamus, and probably even if I had, there is no way I would have thought one up based on this skull. Dragons, maybe. The canines form into massive ivory tusks that grind against each other to keep sharp. These are used in fights and defending their young. Hippos are noted for being very aggressive and sometimes attacking without provocation. Those teeth are capable of inflicting terrible damage, especially when coupled with the fact that these creatures can sometimes reach 5.2 metres (17 ft) in length and are about 5 feet tall at the shoulder. Also, they can run faster than a human for short bursts. Oh my. No wonder they are considered the most dangerous animal in Africa. Despite all that, they are herbivorous, although they have occasionally been seen eating carrion even though their stomach isn't really built for meat. That's one weird skull, man. I certainly agree with what you say about the opossum and the alligator. Those canines are very outstanding! It's interesting to me how much experience you have with skulls, but guess it's natural. Since it's nature and all. I've never thought about having skulls and bones all over the place and actually having to do something about them all. I guess that's what happens when you are surrounded primarily by brick and tarmac! Also thank you for not throwing in a human skull for comparison. We really are the wimpy nerds of the animal kingdom. Good thing we're so good at it. Well, good thing for us, I mean. You know what? The hagfish is the only animal with a skull but no backbone. It's made of cartilage and they have no jaws, so I probably would have included it if I found a good picture. Nature is so weird! You never know what rules will turn out not to be rules at all. As for human skulls, you are so right. 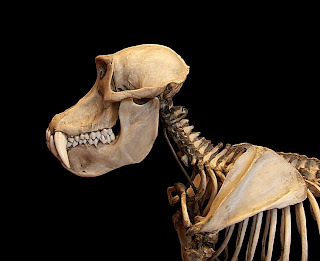 Looking at the Mandrill again, I'm only now really noticing how huge and powerful that lower jaw is. Brains is really the only thing we got. These area all wonderful, but the rows and rows of teeth on the shark are just outrageous! My favorite post of yours yet! The whale is also amazing. Wow. I collect skulls if in in the woods but hardly any as interesting as these! Glad you enjoyed it, Bill! You collect skulls? Wow! I guess it's especially good for you since you can compare and contrast with hands-on experience. Good stuff! Maybe sharks do not need dentists but to me it looks like hippos really do! I have seen many pictures of hippo teeth and they always seem... well, rotten and/or broken. It makes them even scarier! That's so true! There's always all that yellow and brown everywhere. The arrangement also seems so haphazard, they just have bits of tooth all over the place!